Blackpool Heritage Tram Tours are a brilliant way to take in the sights and the Lights. 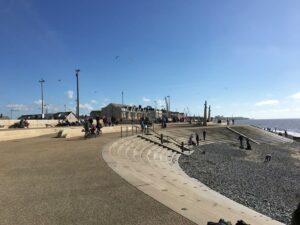 Travel the promenade and enjoy an iconic, traditional part of Blackpool! Don’t forget the dates for the Winter Heritage Tram Tours! The shop tram will be at North Pier Heritage Stop with new Snow Globes, 2019 calendars, teddy bears and a full range of souvenirs. For Winter Heritage Tours, six trams offer tours every 15 mins from Starr Gate-Bispham, extending to Cleveleys & Fleetwood every 45 mins.  Please mention that you saw it on Visit Fylde Coast! 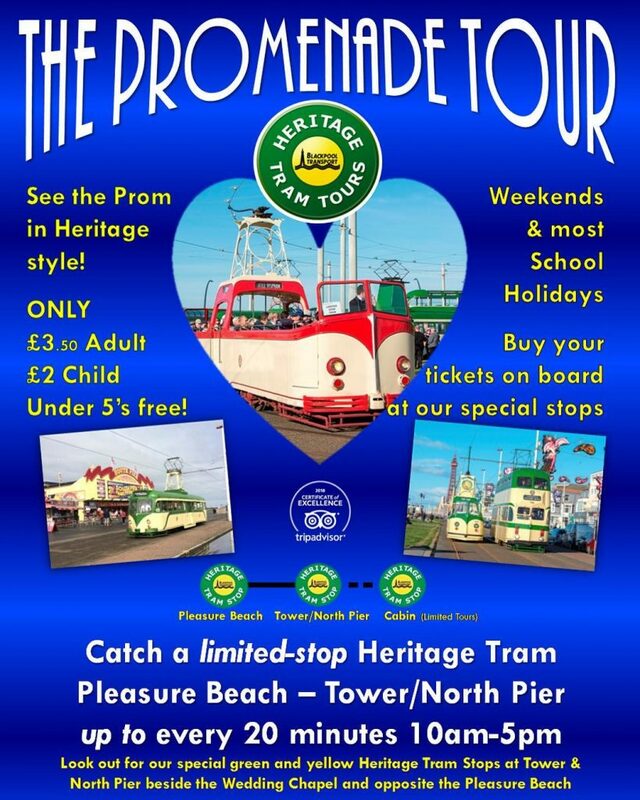 You can enjoy Blackpool Heritage Tram Tours on the promenade at weekends and most school holidays. On selected weekends there are enhanced services for special events. Heritage Trams operate daily during peak holiday weeks at Easter, Spring Bank, for the summer and school half term holidays. Different trams from the Heritage fleet operate Blackpool Heritage Tram Tours on different days. On beautiful sunny days the open-top tram cars come out too! Catch a Heritage Tram at the special stops, up to every 20 minutes between 10am and 5pm. Different trams run on different days, subject to weather and which are available. Adults £3.50, Children £2 and under 5’s go free! Did you know – that when you buy a Blackpool Heritage Tram Tours ticket that you can break your journey? That means you can travel between North Pier and Blackpool Pleasure Beach as you wish. Get off – do whatever – and then get back on again later on the same day for your return journey. Travel to the other end of the promenade, have a fun morning/afternoon/day out, and travel back in style! Did you also know – that in 2017 you voted the Blackpool Tramway as the no 1 attraction in Blackpool on TripAdvisor? 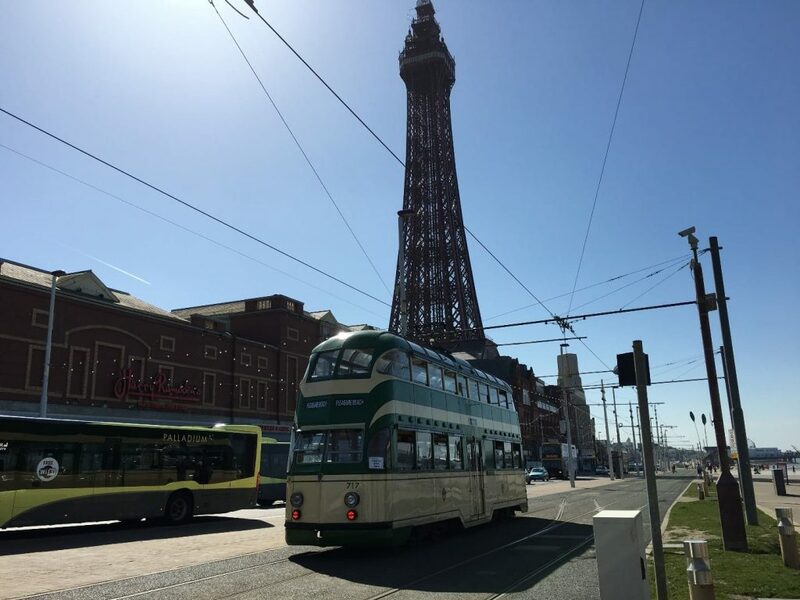 With Blackpool Heritage Tram Tours you can enjoy an experience like no other. Take a ride along the world famous Blackpool Tramway aboard a piece of moving history along the fantastic seafront of this world famous seaside resort. Up until 2011, the “Heritage” cars were the service fleet trams. Operating every day except Christmas Day, they travelled along the tram lines, carrying residents and visitors from A to B. A multi-million pound upgrade transformed Blackpool’s tramway – the tracks were all relaid and a new, modern fleet of low-floor trams are now the service fleet. However, the original Blackpool trams – with their distinctive ‘clickety-clack’ as they drive along – are much loved and as integral to Blackpool as fish and chips and the donkeys on the beach – so a core selection of trams from the original system were kept and returned to passenger carrying duties once more. Many of these original trams are over 80 years old and have been retained and superbly restored. It’s a unique experience as nowhere else in the UK can you still ride on a Heritage Tram on the line for which it was originally built. Blackpool Heritage Tram Tours run most weekends throughout the year, daily during most UK school holidays and, of course, operate our famous Autumn Illumination Tours where you can ride aboard one of the illuminated trams. Along with our Heritage Buses, the trams are also available for hire to help you celebrate your special occasion. 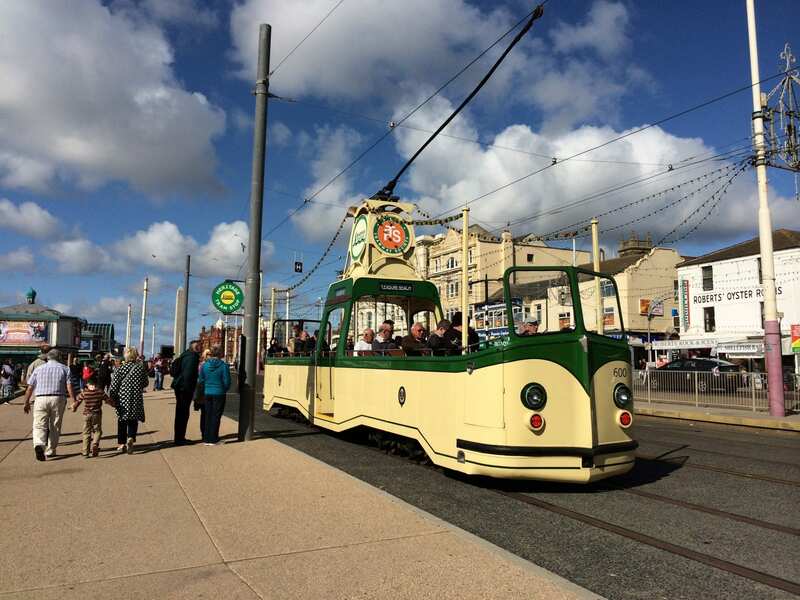 So, whether you want to hire a tram, join us for one of our regular events or just enjoy a very special ride along Blackpool’s Promenade, we have something to offer for everyone. Blackpool Heritage Tram Tours FAQs and Helpful Hints! Can we pre-book tours? – Generally no, just turn up and pay the conductor on board. The only pre-bookable tours are Great British Night Out, Guided Tours and Ghost Tours. Do you operate every day? – Promenade Tours operate most weekends & school holidays. Illumination Tours operate every evening during the Illuminations except Switch On night. Illumination Tours start from Switch-On time until 9pm Sun-Thurs & until 10pm Fri/Sat. Can I get off and rejoin a tour (split tour)? – Daytime tours-Yes, Illumination tours-No. Are Blackpool Transport Saver/Day/24/One tickets valid on Heritage Tram Tours – No. Heritage Day Tickets are available, which also include modern tram and bus services. Where do we buy/how do we pay? 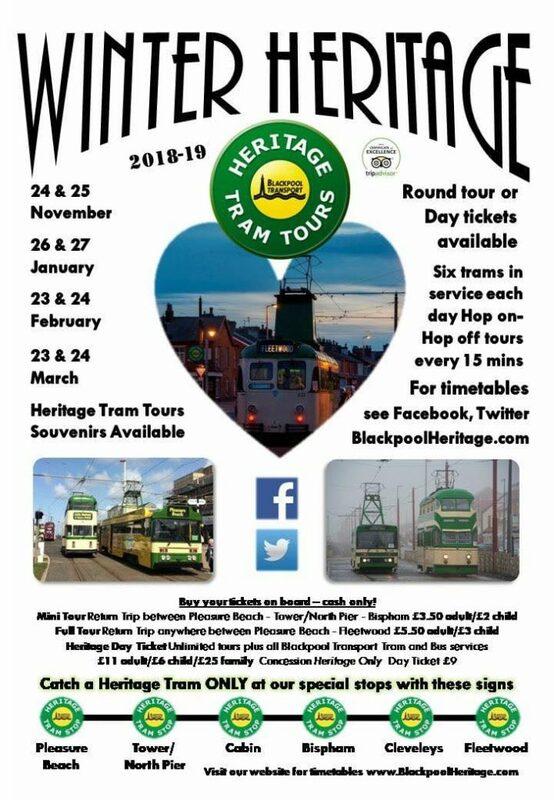 Can we buy Heritage Day Tickets on all trams and buses – Yes, Heritage Day Tickets can be bought on any Blackpool Transport bus or tram services, remember and ask for HERITAGE! Heritage Day Tickets: Adult £11, Child £6, Family £25 – includes all tours/buses/trams. 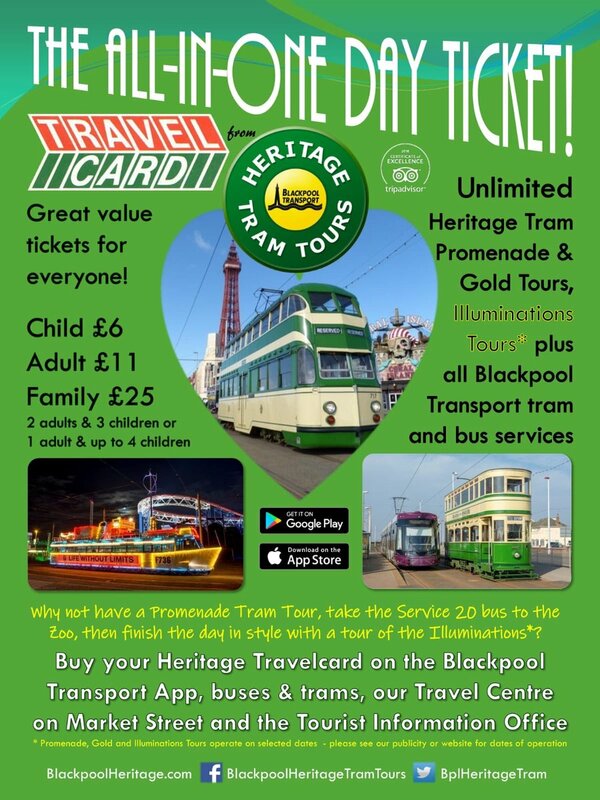 Can we buy Blackpool Heritage Tram Tours Tickets online or on the Blackpool Transport App – No. 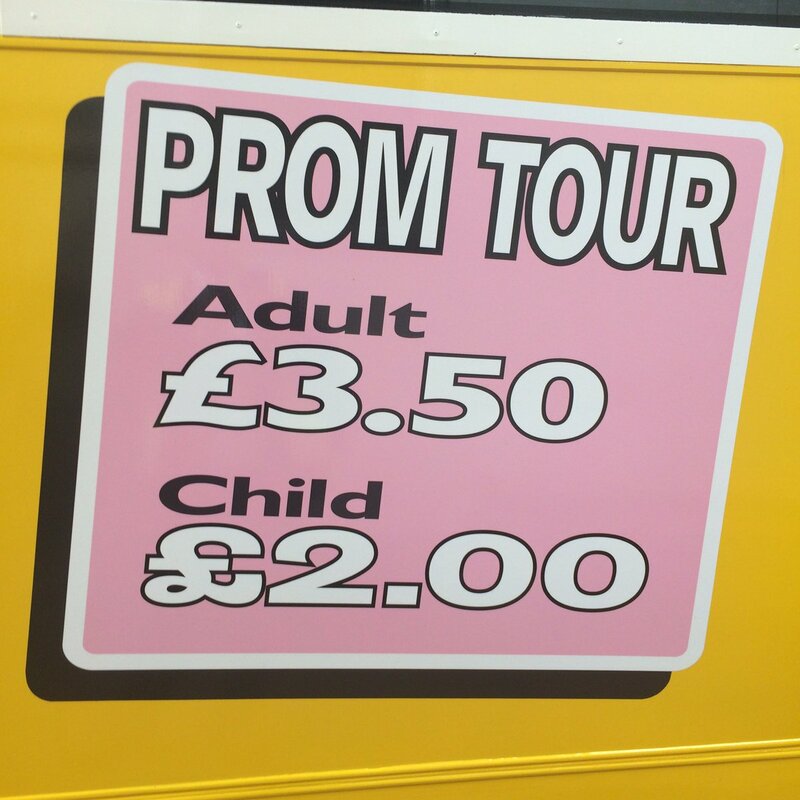 Can we pay by Debit/Credit Card – No, we only accept £cash on our tours. Are concession passes accepted on Heritage Trams – No, sorry these are not valid for tours. Are Heritage Day Tickets valid for 24 hours – No, they’re only valid on the day of purchase. Can I hire a Heritage Tram – Yes, please call Emma on 01253 209521 for more details! What time is best to catch an Illumination Tour? – The first tours are always busiest and then get quieter during the evening, an hour after switch on time is best for a shorter wait! Friday/Saturday are busiest! Tours take just over an hour and operate around every 20 minutes. Where do we catch an Illuminations Tour? – ONLY from Pleasure Beach Heritage Stop. You can alight an Illuminations tour at other Heritage Tram Stops on the return journey. Are all trams illuminated? – Blackpool Heritage Tram Tours use a mix of Illuminated and Heritage trams. You get a great view of the Illuminations from the Top deck of our Double Deckers! All of the heritage Tramcars, are, by definition, old! They need tender loving care, maintenance, and in many cases restoration. Many of them have been moved to different places, different collections, and different owners – so there are opportunities to bring some of them back home, restore them and, one by one, add them to the operational fleet. If you would like to make a donation to assist us with the conservation of our historic fleet, your support would be most welcome. We hold regular appeals to fund our work to preserve our unique collections. To donate please send a cheque payable to “Blackpool Heritage Trust” to 16 Seventh Avenue, Blackpool, FY4 2ED. Alternatively, Blackpool Heritage Tram Tours would very much appreciate monthly standing orders. This form of regular contribution allows us to forward plan projects, and will help us to build on our achievements. It helps us to continue to operate these iconic vehicles on Blackpool promenade where they rightfully belong for everyone to enjoy. A link to Blackpool Heritage Trust standing order forms can be found here.